← Lizzie “Shug” And I Are Bonding Nicely. Well in charge of our UFOs.. UNFINISHED OBJECTS. We are head of that department. 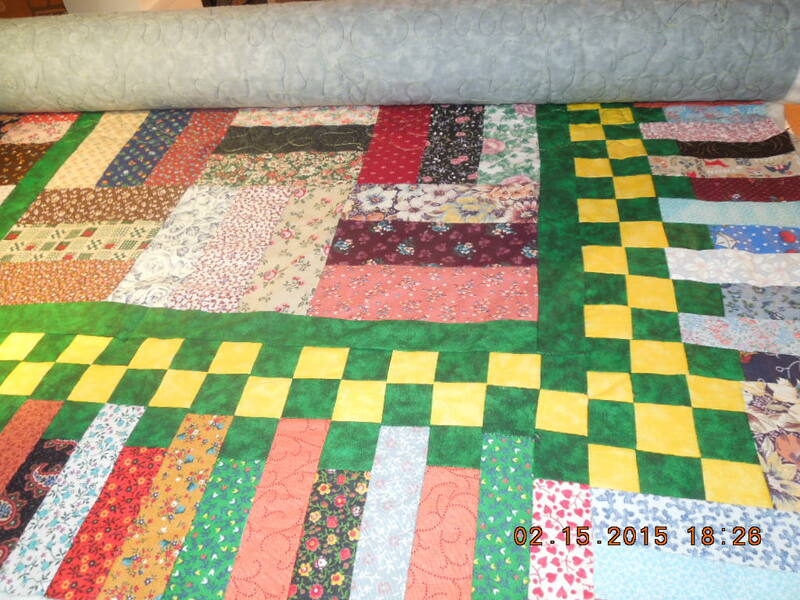 Agent Wade came up today and decided she was going to quilt on a top we made several years ago in a class. 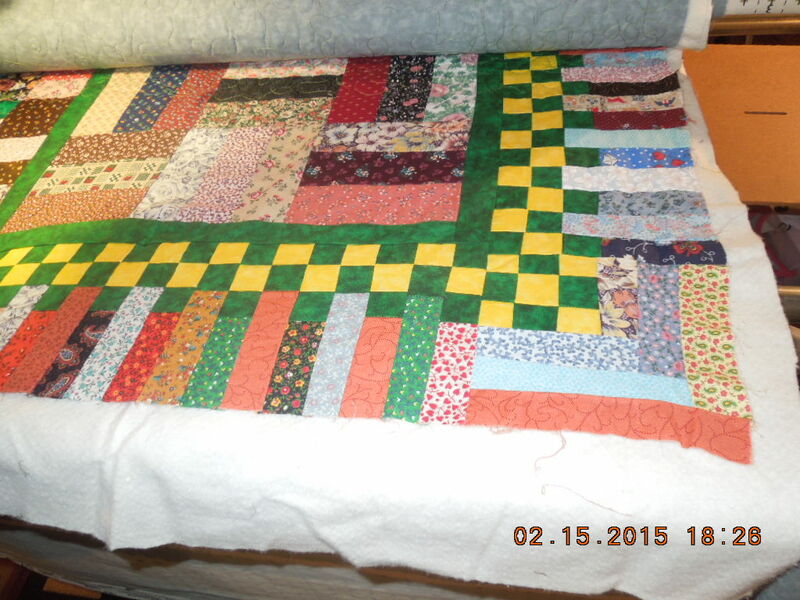 I have all blocks finished on mine put together and now I need to finish the border with the piano keys. That will be coming soon. 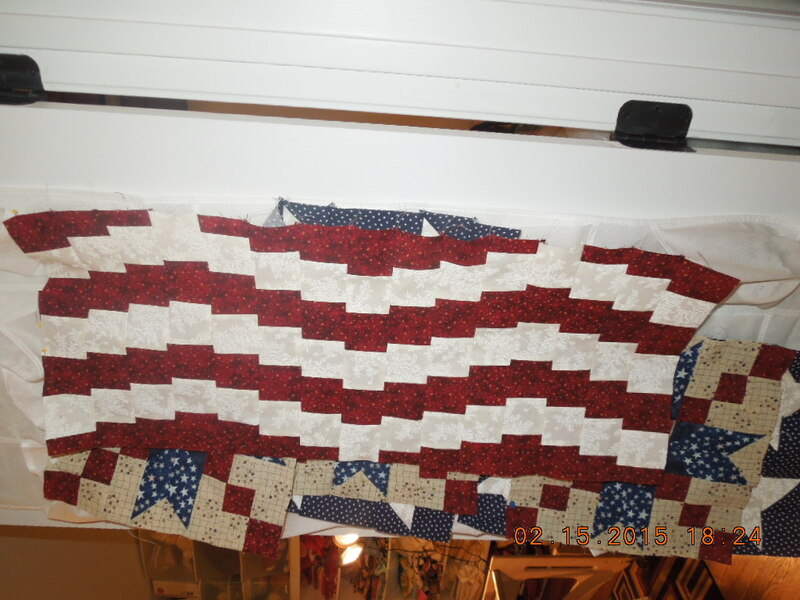 I can not think of anything but this patriotic quilt design I am making for a friend, Janus to take to a raffle for a very good cause I will tell you all about it later and show you the finished project. Until then you can see it in parts. 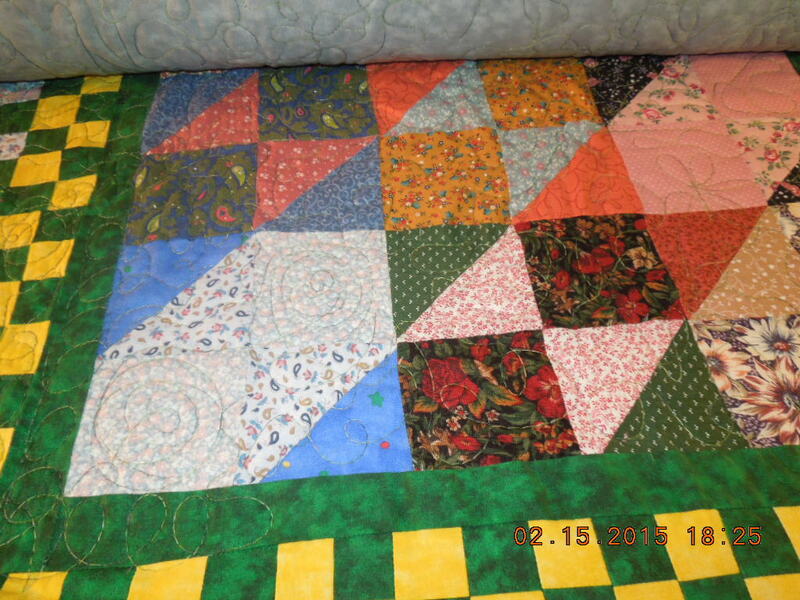 Here is a picture of the first few sections. Those are my pieces. I am just pinning them to the door. I have a shoe rack on the back of my doors going in to the room that Lizzie is in and I just decided what a good place to pin to keep out of the way. I can’t think about my next project. I have to concentrate on this one and this one only. I am sticking to my guns. Agent Wade is busy eliminating her UFOs. Linda has been a friend of mine for a ton of years. I know at least fifteen. She was one of the culprits that was responsible for rolling my yard when I turned fifty and then my husband thought I would be mad and he cleaned it up before I got home from work. Dang it.. My first roll every in my life and I missed it.. I’d been so happy! Well anyway here I go again in Edith Bunker mode. Getting back to the story…..
She was like “did you just snap my picture?” Well yea. She is really concentrating here in this scene. 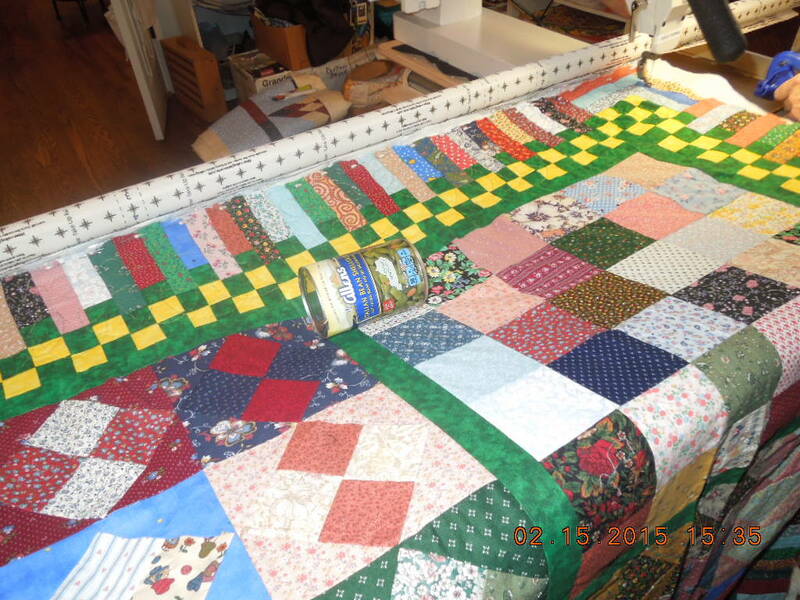 The can of beans you see above is what we found that we love to let roll on the quilt to help us out. Sometimes we use our hands sometimes we use the beans. I told her if this can was missing next time she knew I decided to cook and I better pick up something I do not care to eat. STIFLE EDITH! Back to the story. I ramble on sometimes worse than Edith Baines Bunker. 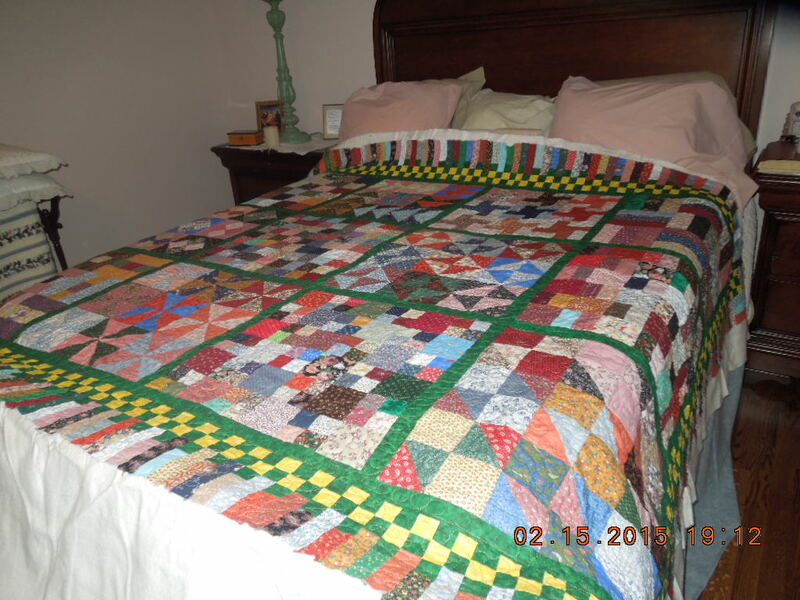 Here is it on our bed.. Not mine and Agent Wade’s but mine and Mr. Wheeler’s. I wanted to clarify that..HAHA. Well anyway I think Linda did a wonderful job. It will be week after next before anyone of us is able to do anything together. I have a birthday party next week for Little Precious..My husband who is turning seventy this week. I can not believe Little Precious is deciding to leave the sixties heading in to a new decade. I am right behind him. Well I still have a good bit of my sixties left. Oh I think Linda did wonderful. 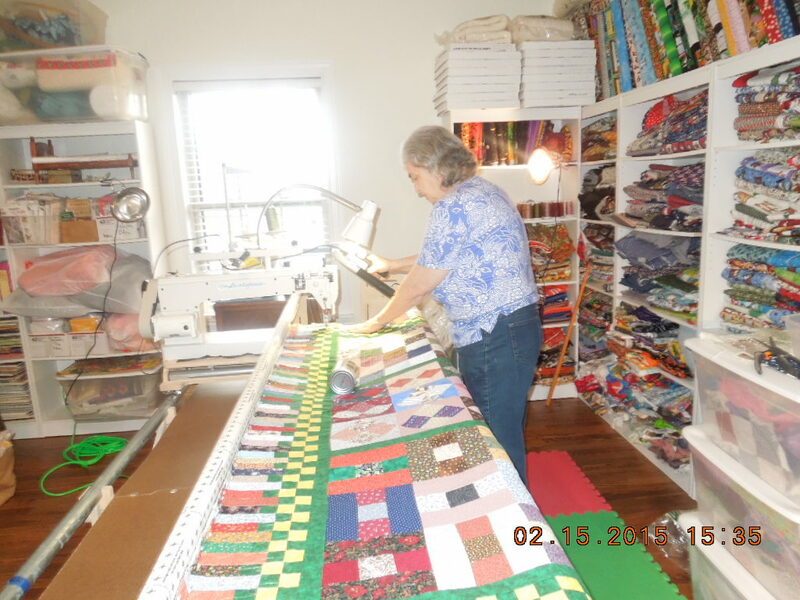 She is very happy with her quilting I am very happy Lizzie is getting a workout after all these years and I enjoy Agent Wade’s company. 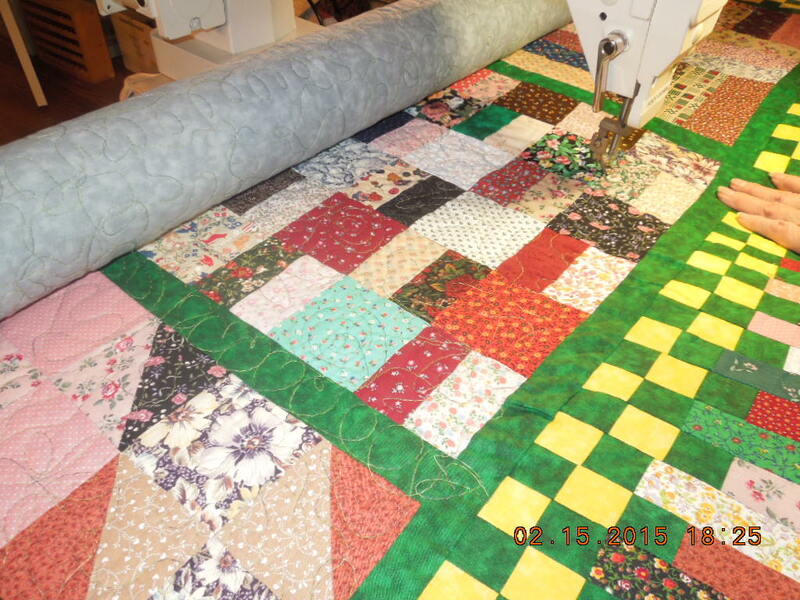 She is an excellent quilter, can sew up a storm, a wonderful friend and just all in all rolled up in one a perfect person. No I am not sucking up to get her to help me with my quilt I am working on. She would without even asking! 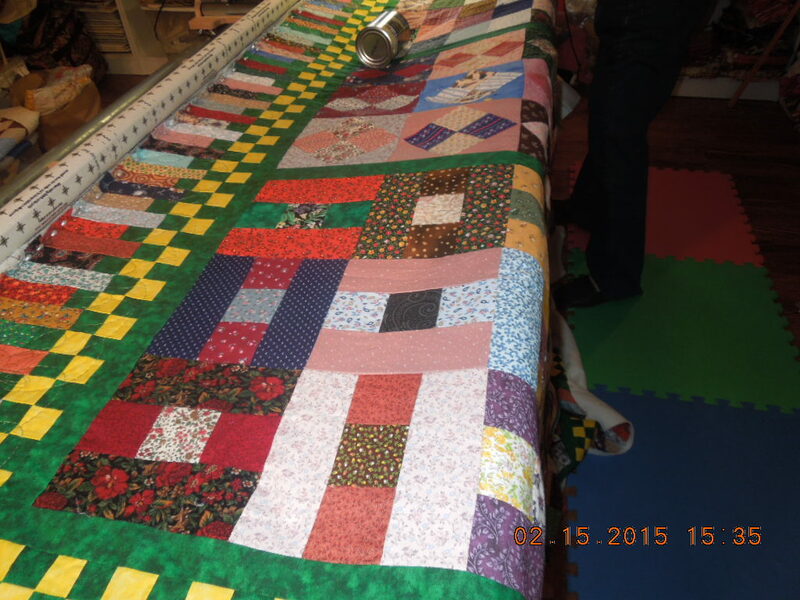 This entry was posted in 2015 New Posts, Main, Quilt Pictures, Shug. Bookmark the permalink. 2 Responses to Agent Wade, Agent Wheeler Heads Of The UFO Department, Locust Fork, Al Division, aka Cray Cray Girl Quilting! Ok next time I will get Little Precious to take our pictures. We need them for our Agent Badges.